Rio de Janeiro (/ˈriːoʊ di ʒəˈnɛəroʊ, –deɪ ʒə–, –də dʒə–/; Portuguese pronunciation: [ˈʁi.u dʒi ʒɐˈnejɾu]; River of January), or simply Rio, is the second-largest city in Brazil, the sixth-largest city in the Americas, and the world’s thirty-ninth largest city by population. The metropolis is anchor to the Rio de Janeiro metropolitan area, the second most populous metropolitan area in Brazil, the seventh-most populous in the Americas, and the twenty-third largest in the world. 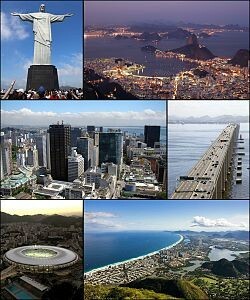 Rio de Janeiro is the capital of the state of Rio de Janeiro, Brazil’s third-most populous state. Part of the city has been designated as a World Heritage Site, named “Rio de Janeiro: Carioca Landscapes between the Mountain and the Sea“, by UNESCO on 1 July 2012 as a Cultural Landscape. Rio de Janeiro is one of the most visited cities in the Southern Hemisphere and is known for its natural settings, Carnival, samba, bossa nova, andbalneario beaches such as Barra da Tijuca, Copacabana, Ipanema, and Leblon. In addition to the beaches, some of the most famous landmarks include the giant statue of Christ the Redeemer atop Corcovado mountain, named one of the New Seven Wonders of the World; Sugarloaf Mountain with its cable car; the Sambódromo, a permanent grandstand-lined parade avenue which is used during Carnival; and Maracanã Stadium, one of the world’s largest football stadiums. Rio de Janeiro will host the 2016 Summer Olympics and the 2016 Summer Paralympics—the first time a South American and Portuguese-speaking nation will host these events, and the third time the Olympics will be held in a Southern Hemisphere city. On 12 August 2012, at the 2012 Summer Olympics closing ceremony, Mayor Eduardo Paes received the Olympic Flag, via Jacques Rogge, from London Mayor Boris Johnson. Rio’s Maracanã Stadium held the finals of the 1950 and 2014 FIFA World Cups, the 2013 FIFA Confederations Cup, and the XV Pan American Games including itsopening and closing ceremonies. Rio de Janeiro also hosted World Youth Day in 2013.